First and foremost, I am happy to be back to writing these entries and I appreciate everyone who takes the time to read this dub writing series of mine. Hopefully with a new wave of dubs taking priority in the industry, I’ll be able to write not only more impressions on shows but also plenty more Dubs w/ Dil in 2019. Not to sound like a walking ad read for it but FunimationNow and their SimulDubs are incredible with how much easier it is to find anime/follow along with the hot series throughout the year. Unfortunately, I had a rather swamped last few months so I didn’t get to watch that many anime. Starting a rather lengthy “catch-up” list for anime binge watching over this past winter break, I dove into a return to anime by watching Trigger’s flashy new action series, SSSS.Gridman, on the raving recommendations from my beloved AniTAY friends. Several of my friends stated this was exactly the kind of show for me (for better or worse I would have to find out-the last time someone told me that, I ended up watching Higurashi). My impressions out of the way here to start, I was hooked on GRIDMAN from the first episode. It has a lot of energy and fun that is needed to make not only an effective Trigger show but also a memorable anime period. The visuals during action sequences were a little awkward to get used to at first, but the stylized art everywhere else managed to smooth the experience. Following the fashion of other Trigger shows, there is a fair amount of depth to the various colorful characters yet it wasn’t distracting from the great pacing. On the topic of the colorful cast of characters, a huge assist in my experience watching SSSS.GRIDMAN was just how great this dub was. 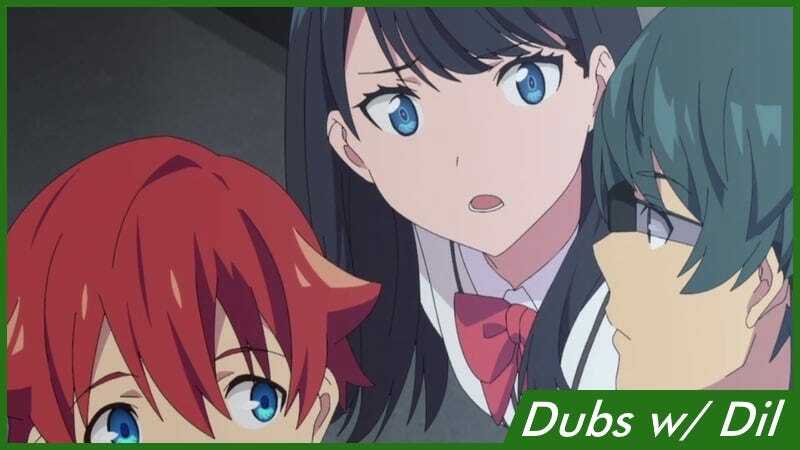 I know there has been an idea that I usually only write good things about dubs, but I typically only write about the ones that move me or that feel like they really help make an anime work for me as a viewer. Typically I will watch anime as dubbed if possible, so whenever I’m writing about a show outside of Dubs w/ Dil and I found one or two of the roles really good, I just leave my impressions of those performances in a quick paragraph or two. That isn’t to say the other actors involved with a dub weren’t good by any means, but I wanted to save this series of articles for the really remarkable dubs (from my own opinion, anyways). With all of that said, the ensemble cast here really brings a remarkable charm to this anime. One of the bigger things I reflected on with SSSS.GRIDMAN was just how clever and entertaining a series that can be arguably viewed as a parody of an entire genre can be while still managing to be fun and simultaneously being fully aware of the roots and history of said genre. This starts simpler with characters that reference back to how things would go in old Kaiju series (specifically the Ultra series) and peaks with a very intrepid move in using one of the biggest reveals in the final act of the series for the sake of nostalgia. This bold jump into parody is so on the nose that instead of working against it, this creative decision allows GRIDMAN to fit the hectic artistry that is a Trigger studio work well. It doesn’t try to be a masterpiece, and it stays within means that keep things really fun in typical Trigger way- beautiful art, breakneck action and comic relief moments that hit far more than they miss. Another part to be really respected with GRIDMAN is how it doesn’t overstay its welcome. The working plot-lines know when to conclude and the characters are developed in a tasteful manner. It doesn’t set out to make anything revolutionary, keeps the action going while still making the audience care enough about the characters to keep going. For being something that draws from the same well that originates the “monster of the week” trope, the situations the characters are placed in with the conflict of Kaiju are interesting enough to keep a narrative on the plus side instead of being a demerit. There is a particular scene that best shows this where the series’ antagonist even comments on the pointlessness in just churning out monsters. This example falls in with the aforementioned self awareness to what it is works in the favor of the series not dragging on too much. The premise alone could be stretched to a 24 episode series at least but I was thoroughly impressed with the decision to keep it contained to a single cour. TL;DR: SSSS.GRIDMAN is a fun ride that is packed full of all of the right Trigger hallmarks like beautiful animation and wild over-the-top action; at twelve episodes it doesn’t overstay its welcome and has a rather respectful self awareness to the genre it belongs to. Chapin is no stranger to being a voice director for a project with quite a few roles belting out high energy lines through action scenes thanks to his experience directing My Hero Academia (which was covered from another Dubs w/ Dil from quite some time ago). Where I think experience shows during GRIDMAN, however, is in how well directed the drama scenes are in the show. While I have written that the material does not get too serious or heavy to the merit of the show, there are still plenty of moments that require effective direction since the entire scene is dependent on how the lines are delivered (I will get into one of my favorite examples of this a bit later). To get such a job right, Chapin had a great work on his resume that could be applied to how effective the dramatic, slower parts of GRIDMAN in his direction of Planetarian: The Reverie of a Little Planet. Planetarian had very quiet, one on one conversations and this can be aptly used throughout the slowed down moments of this work. I’m convinced that if a strictly action anime voice director worked with this, the scenes without fighting might very well miss hard, but instead the audience is given a multiple layered dub that makes the moments where Gridman is not destroying a Kaiju just (if not more) enjoyable. McInnis’ role as Yuta Hibiki is the first of what I want to really express as a refreshing sight in a dubbed anime. McInnis’ voice work before this is not a voluminous one, yet he performs in this like he is a seasoned journeyman in dubs. There is so much fresh talent in this show, and McInnis is one of the headliners here. No one character really pops out as a clear runaway favorite in this series, but this certainly does not undercut the overall product. McInnis serves as a heartbeat to this cast and while it may just very well be how Hibiki’s character is written, it feels like McInnis sets the bar in several scenes with noticeable energy. I’ve longed considered caution when talking about a character that is the “waifu of the season” since fans can be rabid animals when it comes to any and all discussion. Just my luck, GRIDMAN had not one but two of those kind of characters this season. When I analyze a character and their voice actor who delivered a performance, I try my best to see how they fit into the overall project- this is important to note because right around the time a character starts becoming the twinkle in anime fans’ eye, there is a fierce defense of the Japanese voice acting the same fan typically hears them with. This reality alone pits Harris and Seidel in an uphill battle with dubbing critics at large, however I think these two bring a wonderful dynamic to this dub. On their own as individual character performances, there is plenty to appreciate- Harris sells a really good version of Rikka that feels like she is constantly grappling with her thoughts and feeling over the events of the series while Seidel brings out the unstable Akane with a range from menacing to heartbreaking. Together, however, these two really shine in their scenes. There is a lot of benefit working towards this opportunity since these two characters have some of the most important scenes in the series together, however these voice actresses deserve most of the credit. A quarrel I always end up having with folks over the importance of English voice acting in scenes is that there is an importance in delivery that is lost on audiences that cannot understand a language. I typically feel that dubs/subs really just boil down to preference, but there are many scenes between Rikka and Akane I feel like don’t have the same weight without feeling the performances Harris and Seidel give with English delivery. Times like this make me wish I was able to just post clips, but there are several scenes where Rikka and Akane are traveling together and their exchanges are soft spoken and incredibly tense at the same time. While the context certainly helps with this in a sub, there is a wonderful experience of taking in the tense atmosphere in hearing the delivery. I know this is not a particularly popular take/hill I stand on, but I don’t want to have that point take away from how effective Harris and Seidel are with their respective performances. I strongly believe anyone with a rational approach to dubs would really appreciate two of this past year’s favorite characters voiced so well. Dubs w Dil regulars will know that I have a love/hate relationship with Ayres roles- I really like Ayres, but I always feel bad for the guy because I feel like his talents are not always utilized the right way (I’m looking at you key anime [literally every single one that has a dub, yes]). With that said, I’m happy to see Ayres getting quality reps here with Funimation’s push to really bring dubs to the forefront. He is as important to the dub scene as anyone else and I’m happy to see him get his moments as Utsumi in this fun dub. This role works really in favor of Ayres skillset with the young man starting off as kind of a social outcast and becoming a caring albeit hot-headed friend and vital cog in the series. Indeed, Ayres is one of those voice actors that when I see him on the cast list for a new popular series, I have to go “Alright!” since I have an endearment towards an actor that I really liked that was in some projects I unfortunately did (Kanon) not (Clannad) like how his characters were written. McCollum definitely was not the first name that would come to mind for me when I think of hamming things up with a superhero character like Gridman, however I was proven very wrong in this series. On the outside looking in, one would simply expect Gridman to drop a few one-liners during the obligatory Kaiju battles, however I was surprised to see just how involved Gridman was in the pseudo slice of life moments in the show. Hibiki consults with Gridman for advice or guidance quite a bit and Gridman actually ends up becoming a mentor figure of sorts for the young members of the “Gridman Alliance”. McCollum hits his lines snappy and with excitement during the fights as well, which is something that is a must in action series. I kept thinking how much of a departure this role was for McCollum from the likes of being Psycho-Pass’ stoic loose canon cop Shinya Kogami. This definitely makes for a piece to a well rounded resume and a lasting legacy for a certain niche anime fan. I did not know much about GRIDMAN going into this, so Anti’s character and all of the joyful twists that accompany his character was something I could not anticipate. This is a difficult character to get into without spoilers, but without saying any I will just say once Anti’s character arc turn the corner, Fu’s performance gets ridiculously fun and is one of the more memorable parts of the entire series. Similarly with most of this cast, it is nice to see someone conducting themselves like a seasoned pro whilst getting their name out there. I’m hopeful to see more from Stephen Fu in the future. My first experience with Yandell’s voice acting came last winter when I watched GARO: Vanishing Line and later GARO: The Animated Series and was surprised how I did not immediately recognize his voice (not meant as a gloat but a lot of my fellow writers are usually surprised at my ability to do that) so it is really impressive how Yandell could give a performance with a slight change to his usual role with just enough different to throw an audience off his scent. After some reflection, I was thrown off so much because he reminded me of a voice actor in a cartoon I grew up. Perhaps it was the fact most of his character’s lines early on were delivered via a computer monitor, but Alexis reminded me a lot of a character from the cartoon Courage the Cowardly Dog. In the cartoon, the titular dog would consult his computer for a dossier on whatever aberration or serial killer threatens his owners. This computer, voiced by Simon Prebble, would throw a ton of sass and zeal into its responses. Again, it is likely just the computer part of the character, but it was a fun tangent to entertain. His character’s zeal was something that felt very on brand for a Trigger anime and it made me wish for more of his involvement in future Trigger anime dubs. I really wanted to list all of these characters together because they epitomize the “ensemble cast” facet of this dub that I really loved. Individually they were all competent enough to be their own roles I could mention in a quick paragraph, but together this team really feeds off of one another and their neat quirks they decided on for their performances. Each one of these characters really combine their individual charms for some memorable, enjoyable scenes in the “shop” that all of the characters meet at whenever the main trio is at school. Their comfort with solid back and forth conversations made the endgame really sweet when Rikka’s Mother says something to the effect of “I’ll see you all soon” right before things really kick off down the stretch. If these characters just felt like they were individual lines going down the page, there would not be nearly as enjoyable of a time, but instead audiences got a cozy feeling unit. Each of the different members (parts?) of Gridman’s team here have unique verbal tics thrown in to make things even more interesting for these performances. Sinclair has Calibur stutter while Yu makes Borr really feisty with a really well done androgynous voice and Burnett gives winded pouts with Vit while George gives a ridiculously deep ranged scolding as Max. Tons of respect to all of these voice actors for giving something extra to these otherwise background characters. My closing thoughts on this dub should be pretty clear from my thoughts above: I think the sum of the parts really made for a fun and fresh dub. Most of the actors in this project were either relatively unknown by the layman, or from a different job in the dubbing process (Cris George, for example, is typically an ADR engineer for Funimation) however this did not stop them all from turning in unique roles and elevating this source material. I know it sounds like the same song and dance when I do a Dubs w/ Dil, but it really is the special, noteworthy dubs filled with great chemistry like this one that makes me excited to watch a new dub. Typically there are good individual performances that get me through the material, but it is times like this that make me fall in love with the dubbing process. This is a dub full of love and effort and energy that is palpable. If audiences love GRIDMAN enough to try to watch it again, or if they’re looking to take a flyer on one of the best dubs of 2018, I highly recommend watching this one. I just wanted to thank everyone for staying so patient with me as I get back on my feet with writing, this is my first Dubs w/ Dil in over a year. Dubs are something I really cherish in anime and I am happy to finally be able to get back to talking about them with really great readers like all of you. I hope you’re staying warm during this winter weather (I sure haven’t!) and I can’t wait to continue making content soon.I am no longer on social media outlets due to personal reasons, but you can reach me in any of my articles!